Off the top of my head, I can name several athletes that have had at least two tours of duty with a Toronto-based sports franchise. In recent years, Doug Gilmour and Tie Domi came back to play for the Leafs, as did Mike Palmateer, Steve Thomas and Travis Green. Wendel Clark and Yanic Perreault each served three tours of duty with the Leafs. Pat Borders, Rob Ducey, Alfredo Griffin, Pat Hentgen, Cliff Johnson, Dave Stieb and David Wells returned to Toronto during their careers. Mark Eichhorn even served three tours of duty with the Jays, but to my knowledge, only one player had four tours of duty with a Toronto-based franchise, and that was Tony Fernandez. I loved Tony Fernandez. He was on the team when I started paying attention back in 1983 and he was a key part of our first pennant winning team in 1985. He was awesome with the glove, but he could hit for average as well. Always a fan favourite, he enjoyed his first stint from 1983-1990, came back to help us win a World Series in 1993, played his third stint from 1998-1999 and made one last stop in Toronto in 2001 before retiring. Tony Fernandez also had a great name for Murry Eldon speak over the Exhibition Stadium loud speaker. I can hear it now... Toe-neeeeee Fer-NAN-dezzzzzzz. Tony was my favorite too. I have an autographed ball from him as well. 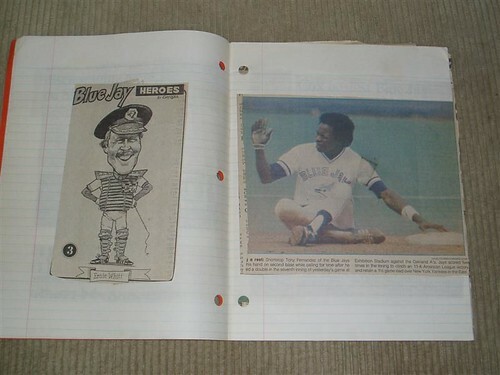 Did you know In 1986 he became the first Blue Jay to record a 200-hit season, setting a major league record for most hits by a shortstop in this century by collecting 212 of his 213 hits at that position. When they traded him and Mcgriff for Carter and Alomar all i could remember thinking was...this Alomar kid better be good...and he was but He never replaced Tony, luckily as you said Tony came back and was on one of the World Series Teams I believe.